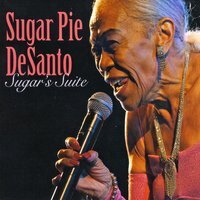 Sugar Pie was discovered in 1955 by bandleader Johnny Otis who named her "Little Miss Sugar Pie". Sugar grew up in the San Francisco Fillmore District and was one of 10 children. Her father was Filipino and her mother was African American. She recorded her first hit for Oakland producer Bob Geddins in 1959. He sold the master to Chicago's Chess Records where she was signed as an artist as well as a staff song writer. She wrote for Fontella Bass, Billy Stewart, Little Milton, Minnie Riperton, Bobby McClure and The Dells. In 1960 she hit the road as the first female vocalist to be featured with the James Brown Revue, opening for James for a year. In 1964 she was the only female that toured with the blues legends: LightnIn' Hopkins, Sonny Boy Williamson and Howlin' Wolf and Willie Dixon who toured Europe as part of the American Folk Blues Festival. Do yourself a favor and find her on Youtube to see her performance at the 1964 American Folk Blues Festival. The 1966 hit "In the Basement" was a duet with her old San Francisco friend Etta James. In Philadelphia in 2008 she received the Rhythm and Blues Pioneer Award along with Chaka Khan, Bill Withers and The Whispers. Aretha Franklin didn't perform but was in the audience and was so impressed with Sugar Pie's performance that she invited her to perform at two of her Christmas parties. She is a fan favorite at the annual Poretta Soul Festival in Terme, Italy having appeared there several times. Sugar's Suite is the latest of five CDs recorded on Jasman Records .